With Black Friday tomorrow and Christmas looming many of us are starting to feel the burn when it comes to business. It really is ‘nose to the grind stone’ time and we’ve had a lot of support queries over the past couple of days on how to set up last minute offers, the best ways to create a buzz and how to boost sales over the festive season. So here are seven things you can do over the next twelve months to guarantee success this time next year. Many small business owners make the mistake of launching an offer and then trying to find an audience who would want it. However it would be far more beneficial to build an organic and engaged audience and then offering discounts and promos to suit them. This is why it’s important that you take a good look at your site traffic. Site traffic is a very good indicator of your audience size, as well as giving a fairly accurate idea of the number of people who are returning and engaging with your business on a regular basis. So before you spend time planning special offers focus on increasing the number of visits to your site. Try to set a specific goal (such as 100 daily visitors) and then create actionable steps that will help you get there (like blogging, social media, networking, advertising etc). This does require a lot of patience but increasing your traffic and audience size is essential to eventually creating a buzz around your business. For a customer it’s hard to resist an offer that is genuine and ticks all the right boxes. If you listen to your customer base they will tell you exactly what they need. So how do you listen to your audience? By asking for feedback, reading comments on your blog or social media platforms and reading contact form submissions and emails. What are your most frequently asked questions? What do people ask your expertise and opinion on? What problems do they seem to come across? It’s completely understandable to feel a little self-conscious when promoting your business. It’s a very ‘bare all’ experience and it’s hard not to take things personally. A lot of people think that promoting once or twice on a few social media platforms is enough – any more would be over-sharing or annoying to their audience. However there are two issues with this way of thinking. The first is that you are assuming that your audience isn’t interested in what you’ve got to offer. The second is that if people are going to ‘unfollow’ you because you’re sharing information about your business, then they aren’t going to purchase from you anyway! The purpose of using social media for business isn’t to show off and ‘toot your own trumpet’, it’s to funnel potential customers to your website. The general public completely understand this, we’re used to it! Post to Twitter between 10-14 times a day. The shelf-life of a Twitter post is approximately 18 minutes which means it’s perfectly acceptable to post more often than on other social platforms. Although try not to post more than once per hour during the week and roughly every three hours over the weekend. Post to Facebook between 1-2 times per day. The shelf-life of a Facebook post is approximately 90 minutes. Post to Google+ about twice a day but try to avoid the weekends. It’s not only important to promote your business on social media platforms but also to take careful consideration over the wording of each tweet, post or email. The way you pitch to your audience can make or break a sale. No one is going to buy something that’s vague or doesn’t have an obvious value. You have to provide your audience with specific information. Make sure you remove any doubt about working with your business by explaining exactly what they will get for their money. For example ‘a timeless and personal photo gift that will capture wonderful memories for years to come’. Also I know it’s hard to convey everything you want a customer to know in 140 characters so make sure you do a great overview and include a link to more information. One of the most effective ways to create a buzz around your business is to warm people up to your idea slowly. This is also known as ‘pre-selling’. The objective of pre-selling is to create interest before you introduce your offer. This can easily be done through some clever marketing on your blog and social media e.g. ‘5 reasons why print is better than download’ or ‘why a photo gift is the perfect Christmas gift’. We all know that creating a sense of urgency leads to impulse buys or bookings. Creating this sense of urgency is best done through offering limited quantities for example only ten portrait sessions or a promo code that only lasts 24 hours. However this strategy is very much dependant on your type of business – for some it’s a great idea and for others it’s limiting. Create a plan for launching your offer and set a sequence of events. Don’t just throw your offer out there to see if it sinks or swims, instead build anticipation by talking about your offer and then waiting for some time before launching it. During this waiting period, share more information about your offers on your blog, through email marketing and on social media. 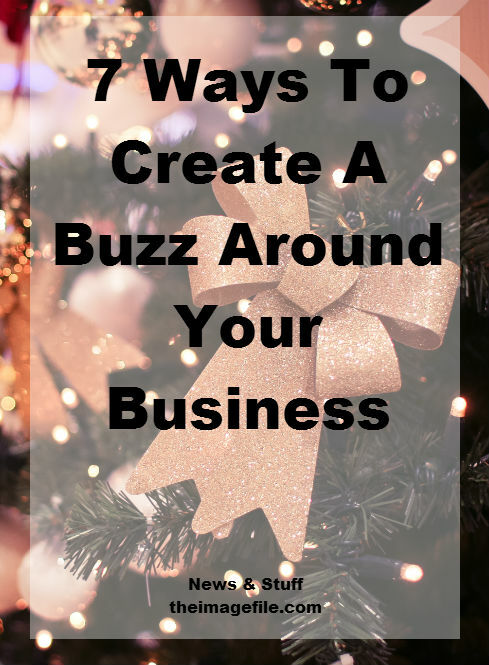 How do you create a buzz around your business? Is there anything that has worked particularly well in the past?